It's sad to read in the liner notes for the new Eclipse set, Silent Naruse, that of the twenty-four films that the Japanese writer/director Mikio Naruse made in his first years of filmmaking, only the five contained here still exist. An early cinematic pioneer whose career spanned nearly half a century, he made eighty-nine films in total, and only about half of them have survived the decades since. In an age when film seems so permanent, and even the worst box office dud gets preserved in high-definition for future generations to suffer through, we can't forget that, once upon a time, the art of movies was mutable. Thus, Mikio Naruse is a director that more of us probably know by name rather than by his work. He was an artist whose specialty was what was termed the "woman's picture." Like Douglas Sirk in the U.S., Naruse made movies that, for the most part, focused on family drama with a female center. 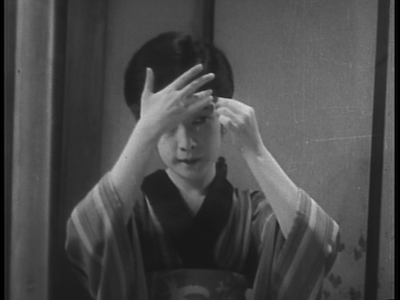 Many of his films were emotional tales that explored the unique struggle of women in Japanese society--particularly those who lived on the fringe, either economically or socially, or sometimes both, one dictating the other. This peek into his earliest work confirms that these were issues he was concerned with from pretty much the get-go, though the core ideas would be ones that would develop over time, along with his style. 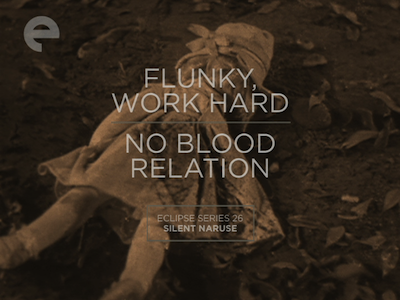 The 1931 short Flunky, Work Hard (28 minutes) is the oldest surviving film from Naruse. It's a blend of comedy and drama, centered around the family of a meek insurance salesman (Isamu Yamaguchi) struggling to make ends meet--so a rare entry where the main character is actually a man. If he can just seal the deal with a large neighbor family, he thinks things will be all right, but his son (Seiichi Kato) keeps getting into fights and the salesman fears it will cause him to lose the account to his competitor. (In one funny scene, the salesman lets the family's kids play leap frog over him so they'll like him better than the other guy). The movie has broad humor, including little boys hitting each other on the head with their shoes and similar physical gags, but it also takes a turn for the dramatic. The final scenes have an O. Henry element, with events growing bittersweet and ironic. 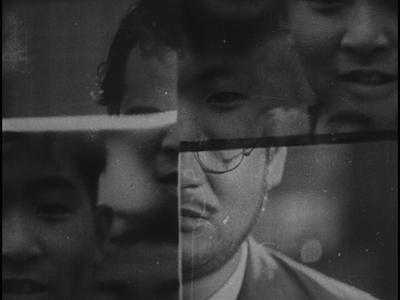 Most striking, though, is Naruse's impressionistic experiments, using double exposures and mirror images and other camera tricks to mimic his hero's anxiety. Though rudimentary by today's standards, and possibly even by Hollywood's special effects level at the time, it is admirable to see a filmmaker employing every trick at his disposal to enhance what is essentially a fluffy one-off. There are no such effects in No Blood Relation (79 mins. ), released the following year. In fact, it's like Naruse only has one card to play: he just discovered the emphatic zoom. There is a lot of quick pushes as characters react to one another in this middling drama from screenwriter Koga Noda, Ozu's regular writer. The story revolves around a young girl (Hisako Kojima) who was abandoned by her mother, Tamae (Yoshiko Okada), when she went off to be an actress in America. Tamae returns with fame and fortune in hand, and she and her brother, a two-bit hood, try to get the girl back from her ex-husband (Shinyo Nara). He is on his way to debtor's prison, having run his business into the ground, and so it opens up a door for Tamae, even though the girl sees Masako (Yukiko Tsukuba) as her real mother. She's never known Tamae and rejects her. No Blood Relation is based on a play by Shunyo Yanagawa, and it is primarily a depiction of the push and pull between the two mothers--though Masako is a good person and so not nearly as forceful as her rival. Plus, the concerns over money mean she has to work and worry about paying rent, whereas Tamae has unlimited resources. There's not much more to it than that, and to be honest, No Blood Relation can be a little slow going. There is some occasional comic relief from Tamae's brother and his purse-snatching cohort, but that tends to be pretty mild also. It's not that No Blood Relation is bad, it just didn't strike me as having much to distinguish it from any other average melodrama of the period. By its predictable happy ending, I was ready to move on. Within the next year, Naruse's technique would grow more sophisticated. His agility with film language would become more apparent, and he would also transition into some of the thematic elements that would define his career, foreshadowing even his most well-known film, the 1960 feature When a Woman Ascends the Stairs [review]. 1933's Apart From You (60 mins.) displays a surprising confidence and a more natural flow than No Blood Relation. 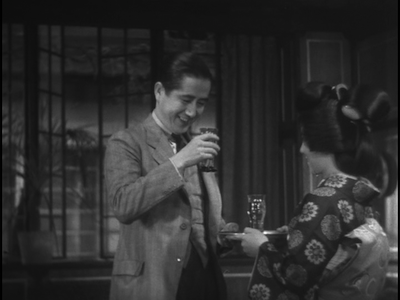 Naruse takes over screenplay duties again, as he did in Flunky, to tell the story of two geisha of differing ages. Kikue (Mitsuko Yoshikawa) is older and starting to lose her beauty and her motivation, and Terugiko (Sumiko Mizukubo) is the younger woman whom she has taken under her wing. Kikue's homelife has turned difficult, her son (Akio Isono) doesn't respect her and resents her career choice. As he falls in with a bad crowd, it's up to Terugiko to help keep him from throwing his mother's good efforts away. Terugiko has only became a working girl to support her family, and her own sacrifices illuminate the struggles Kikue has endured to give her child a better life. Apart from You is a good example of how traditional stories and even heavy melodrama can, despite their familiarity, be effective in the right hands. 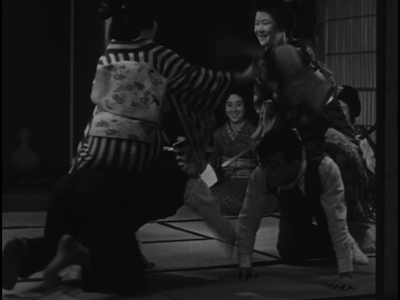 For the most part, Naruse drops the heavy zooms and develops a more elegant mis-en-scene. At just an hour, the story never lingers too long, and he relies more on suggestion than overwrought dramaturgy. In particular, the director's focus on smaller details, on the individual components of everyday life, create a more effective portrait of what are essentially average people. The focus on the holes in the son's socks, and the humorous solution that Terugiko's little brother comes up with bring these characters to life by exposing their most minor concerns. If our day-to-day is the accumulation of the small stuff, then maybe the big stuff can be seen as small, too. The editing style, favoring more individual shots and cutaways than was popular during this period, emphasize Naruse's mosaic approach, the bigger picture emerging as he arranges more and more of the smaller ones. Sumiko Mizukubo is a surprising screen presence. Her performance has an effortless charm that, through considered gestures and expression, creates an immediate intimacy with the audience. Though we are told that society judges girls who become geisha harshly, Mizukubo makes Terugiko human, and so she draws our sympathy rather than our condemnation. 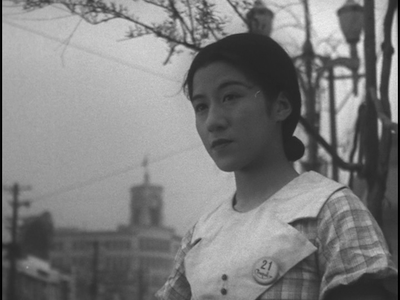 The actress only made 18 films in her career, including one with Hiroshi Shimizu in the same year as Apart from You; alas, none of the others seem to be readily available. Also from 1933, Every-Night Dreams (65 mins.) is an obvious companion to Apart from You. Based on a story by Naruse, and with a screenplay by Tadao Ikeda, it has a heavier tone than the other films. 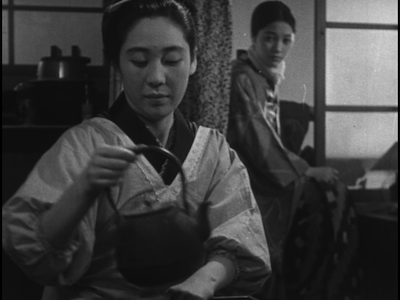 This somber silent tells the story of Omitsu (Sumiko Kurishima), a single mother who works as a geisha in a seamy portside bar to support her son (Teruko Kojima). Her existence is a dour one, but she carries on valiantly out of love for her boy. When her husband (Tatsuo Saito) returns three years after he abandoned them, it threatens to disrupt the balance that Omitsu created. He swears he's changed, and he does try to get a job, but things don't go so well--particularly after the husband loses his cool when a client that loaned Omitsu money tries to collect in non-monetary ways. 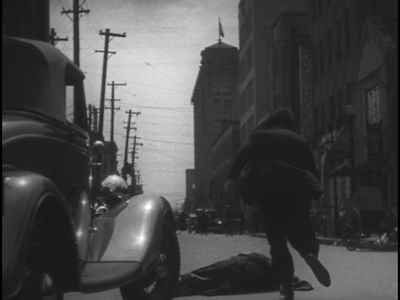 Naruse uses a plot device similar to one in Flunky in Every-Night Dreams: their son getting hit by a car forces the parents to reassess what they are doing. It's more O. Henry irony, with the desperate measures of desperate times yielding disastrous results. 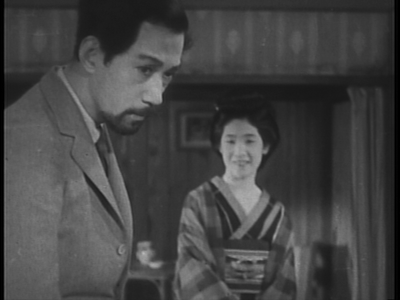 This one ends on a downbeat, and once again, Naruse has cast his lead well. Sumiko Kurishima is a ghostly beauty whose serious manner lends a stony weight to how she moves and acts. 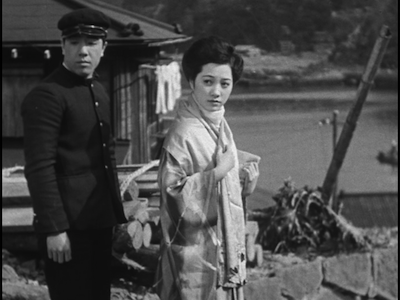 There is much gravitas here, and Naruse and cinematographer Suketaro Inokai, who shot every movie in Silent Naruse except Flunky, continue to dial back the dramatic camera work and instead work simply, using the seaside setting to capture the realism of Omitsu's squalid existence. Some of the writing still goes for the big emotion, but the way the actors downplay what could be weepy and overdone lends the story machinations credibility that in turn inspires the audience to have faith in the integrity of the montage. The final movie in the Eclipse set was also the last silent film Mikio Naruse made, and his final at Shochiku. 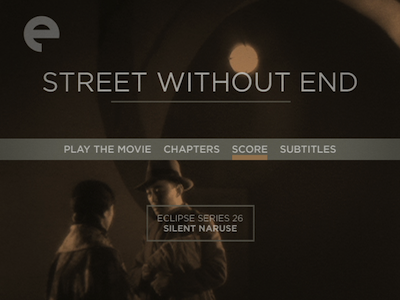 1934's Street Without End (88 mins.) was based on a popular novel by Komatsu Kitamura, and the screenplay was adapted by Tomizo Ikeda. Like the film that preceded it, Street Without End also relies on the plot device of an automobile accident, though this time coming early in the movie to set up where the rest of the story will go. Setsuko Shinobu stars as Sugiko, a waitress in a diner who, at the time she is hit by the car, is trying to decide between marrying her boyfriend (Ichiro Yuki), who will be going against his family to be with her, or to take an offer to become a film actress. Her head is in the clouds of these possible scenarios when Yamanouchi's car careens into her. The handsome, moneyed bachelor (Hikaru Yamanouchi) quickly spirits her away, leading to her losing both the marriage and job offers, but replacing it with something else. Street Without End, in a way, is a rags-to-riches-to-rags tale for the bulk of its characters. Sugiko's marriage to Yamanouchi isn't a good one: he also is going against his family, and his busybody mother and sister (Fumiko Katsuragi and Nobuko Wakaba) refuse to be pleasant about his "selfishness." At the same time, one of Sugiko's friends (Chiyoko Katori) takes the opportunity her pal missed, and she takes along her own boyfriend (Shinichi Himori), a painter, getting him a job in the movie studio art department after she signs on as an actress. These choices bring consequences, too. Nothing overly terrible, but things were easier, more comfortable, back at the tea shop. Naruse is probing his characters, pushing them to ask themselves what it is they want versus what it is they have. He is also critiquing the strict adherence to tradition and how it leads to disappointment and class resentment. Naruse has all but removed the overtly demonstrative camera moves by the time of Street Without End, settling into a far more considered approach for how he puts his scenes together. Watching Silent Naruse front to back, you can see his style become more and more grounded. The events themselves pack enough punch, to bang the audience over the head with visual histrionics would only undermine the truth and humanity at the heart of the script. The actors show restraint, as well, preferring a quiet manner and subtle gesture to the big expressions that most people (unfairly) think of when they think of silent cinema. Admittedly, the closing film isn't all that electric, and even patient viewers might find that Street Without End drags from time to time, but the final scenes offer an uneasy balance between empowerment and disillusionment; the last fadeout has tremendous impact. Sugiko's stillness leaves the next move up to the audience. What lies ahead is probably only more struggle, but the valiance of her resolve is clear, even if her satisfaction is not. 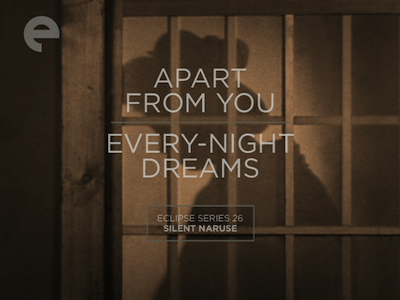 The Silent Naruse Eclipse set brings together five movies on three discs. The first two discs have two movies apiece--Flunky, Work Hard and No Blood Relation on one, Apart From You and Every-Night Dreams on the other. The longest movie in the set, Street Without End, gets the last DVD to itself. All five films are full frame, and the discs were struck from the best sources available, and so it can be a take-it-as-it-comes affair. The older the film, the more the damage, with regular scratches and noise on the black-and-white image. Luckily, the damage is not persistent and never so pronounced as to obscure the image. Every-Night Dreams has the softest picture, and it's more bleached and white than the others. The boxed set doesn't boast a full-scale clean-up, but the digital authoring is good, so it's clear Criterion took the best care with putting the product together as they could. Given how much of a miracle it apparently is that these movie exist at all, we should just thank our lucky stars that they are now preserved in a format that will last. The movies are all presented as either completely silent or you have the option of playing new scores by Robin Holcomb and Wayne Horvitz. These need to be turned on at the main menu. The pair provide solid musical accompaniment, laying a foundation for the movies without overshadowing the events onscreen. The scores are piano and violin mostly, with some percussion and other instruments used sparingly, and my only complaint is that, occasionally, like in No Blood Relation and Apart From You, they added passages that got a little jazzy for my taste. 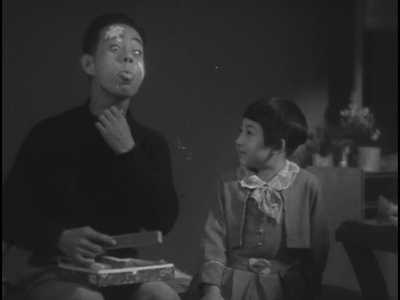 The Eclipse boxed set Silent Naruse is a wonderful time capsule, the only remaining snippet of the great Japanese director's early career. Collecting his five surviving films from the silent era--and indeed, the earliest he has available--it shows how he honed his craft, going from family comedy to full-blown melodrama, elevating the low-end "women's picture" to high art. The sailing is not all smooth, some of these films can be slow going, but the pairing of Apart from You and Every-Night Dreams in particular has a sincerity that allows the material to transcend the rough patches.